When planning any prospective car project, a checklist inevitably begins to take shape during the process, and it must be completed before the project is considered to be totally finished. Some of the items on the list would include additional power, improvements to the handling and appearance, and creature comforts out the wazoo, not to mention the all-important overall “stance”. All “tuner cars” follow this template but exactly why certain modifications are chosen is what separates the men from the boys. If you get it right, your eye-catching vehicle will garner accolades and trophies. Get it wrong and, well, let’s just say that you won’t be receiving a call from us like Las Vegas, Nevada-based Robert Green did. 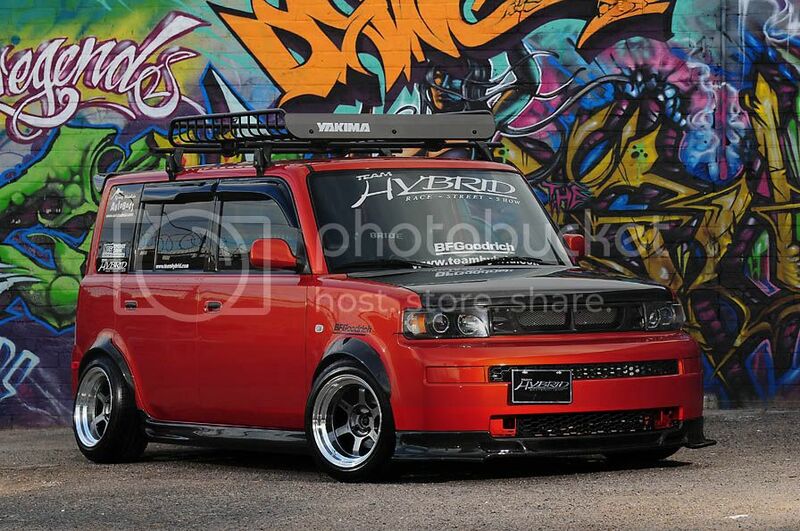 His Lava Orange Metallic 2004 Scion xB has placed a check mark in every box. Green started with an automatic transmission xB, but that didn’t stop him. 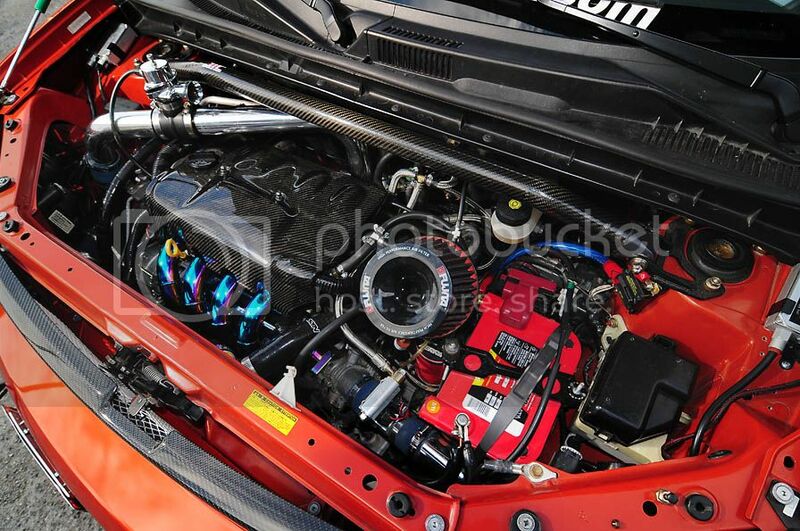 He contacted www.turbokits.com for a custom system which would work with his 1.5 liter 1NZ-FE engine. He added a Weapon R Neochrome intake manifold and a Fujita cold air intake and oiled-cotton cone filter to increase airflow. 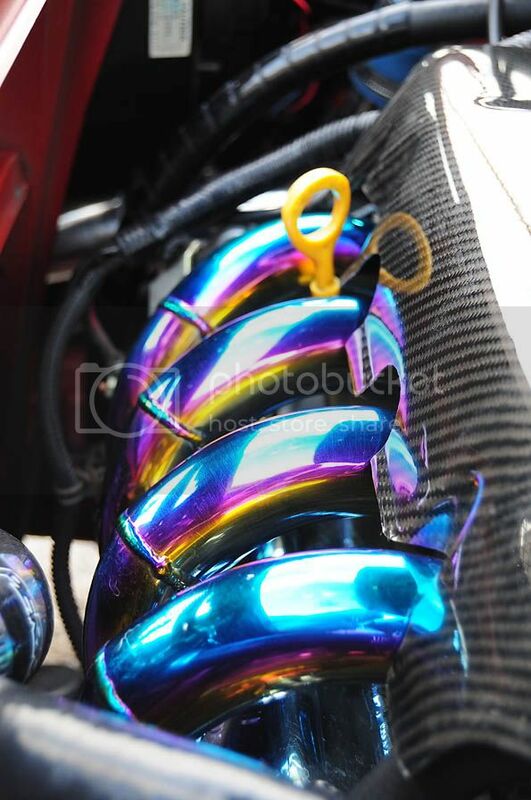 A beautiful custom exhaust manifold was built and installed by Trev-Tec, which also handled the power adding upgrades. Perrin hoses and a Perrin oil catch can keep the fluids in check. GReddy’s SP2 exhaust system adds a touch of vocal menace to the sound, but resists the “fart can” vibe heard from cheaper mufflers. This adds up to 105 horsepower at the wheels, and 138 foot/pounds of torque, which does not sound like much, but works very well for cruising low and slow. “Low” is definitely the operative word for Green’s xB, since the Air Runner suspension allows him to drop it to the pavement when he parks. Bellowed front struts and rear air bags are pressurized by air stored in a polished tank just inside the rear hatch. 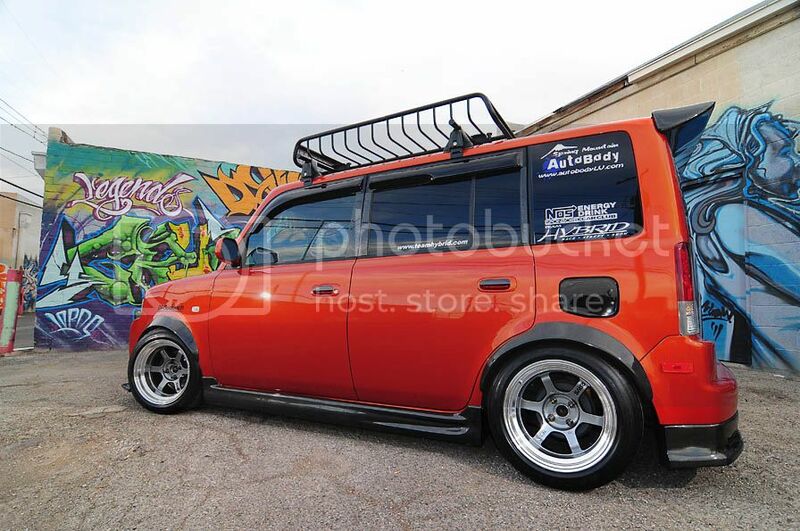 To get that coveted “wide body” look, he added carbon fiber fender flares and bronze Rays TE-37V wheels in a -15mm offset. 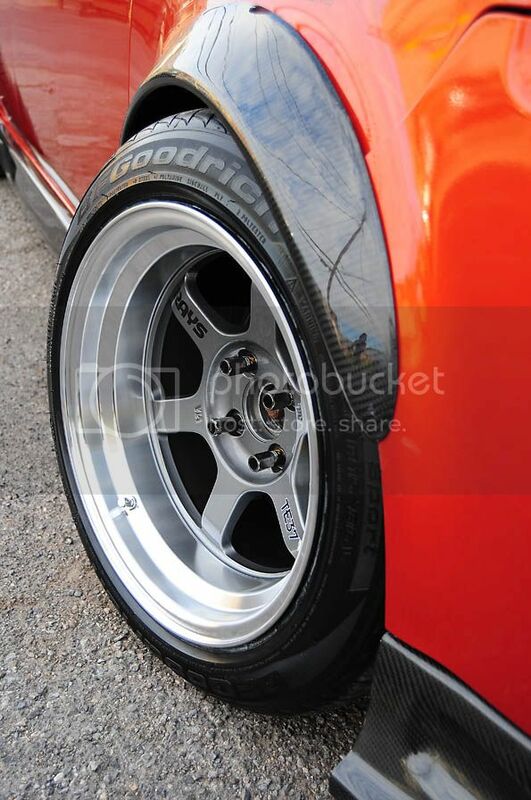 With 215/50-15 BF Goodrich tires stretched over the 15x9” wheels, going too low places the tires in contact with flares, but damn if it doesn’t look cool that way! A JIC Magic carbon fiber front strut brace and a Sustec four-point chassis brace keeps this box square. Part of the secret of this “stance” is the Real Camber shims Green used; -2 degrees in the front and -6 degrees in the rear. This keeps those wild wheels tucked in hard. The aerodynamics have been updated with X2’s wicked carbon fiber lip kit, and a Racing Solution carbon fiber grill graces the nose. Topped off with Seibon’s hood and rear hatch and a bBist carbon fiber rear spoiler, there’s a whole lot to like about this box’s appearance. Fans will also note the Spec-D Halo Edition headlamps and the TRD smoked gas cover. Green installed a Yakima storage rack to the roof, creating space for additional cargo capacity, needed due to his extensive interior conversion. 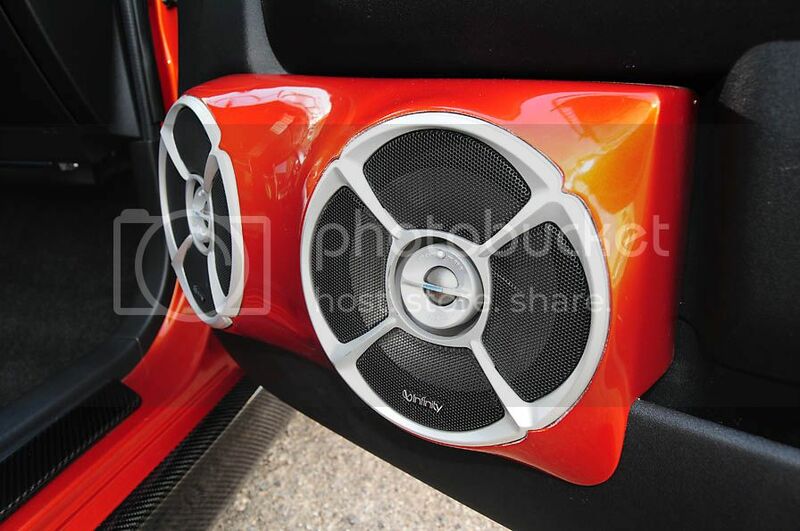 Inside the cabin, the xB has been transformed from a miniature people hauler into Green’s personal mobile stereo. 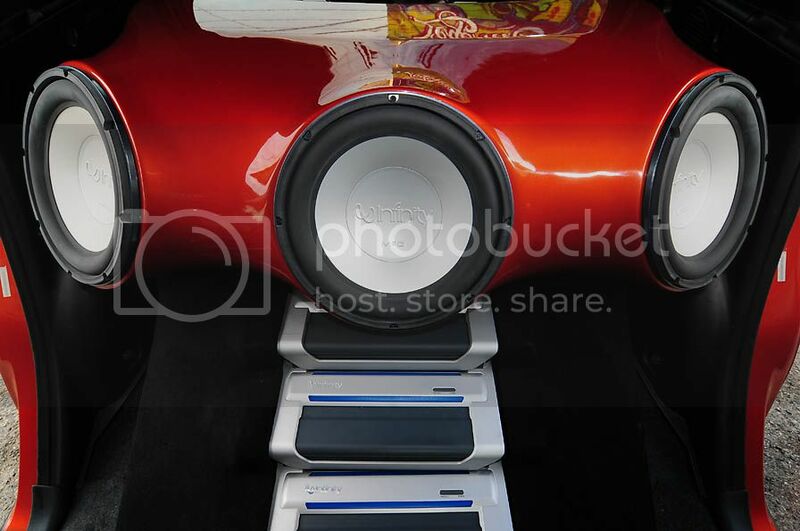 He’s had Creative Audio do some creative thinking, and they came up with a custom sealed fiberglass enclosure which holds three Infinity Reference Series 12” subwoofers, three and RS 1300A sub amps, an RS 475A midrange amp, and his Air Runner air tank. There might be even more hidden in that “lava dome”, like the two Monster Cable 300 Monstercap 1 Farad bass capacitors and the Powersplit distribution blocks; exposed wiring is seriously uncool now. 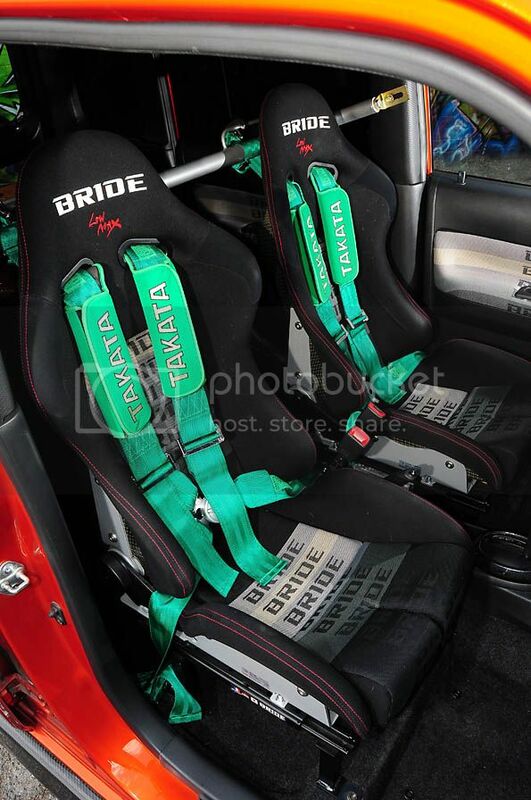 Since the rear seats have been deleted, Green’s made sure that the driver and passenger are well supported with Bride Low Max carbon Kevlar seats. The door panels and headliner have been decked out in Bride gradation fabric to match the seats. Speedware Motorsports harness bar and two Takata four-point harnesses provide suitable restraints. Keeping with the carbon fiber theme is an NRG Innovations Pilota steering wheel mounted up on a short hub and NRG’s very slick version 2.0 quick release. Weather Tech floor mats handle the worse that the desert’s monsoons can throw at them in terms of dirt and water, while the revised door panels support Lava Orange-painted custom door pods each hold a pair of Infinity mids and tweeters. Driven by a Pioneer AVIC-X930BT head unit, the ICE system is built to handle any musical style. Sometimes, what happens in Vegas is just too sweet to remain hidden in that dusty desert metropolis. 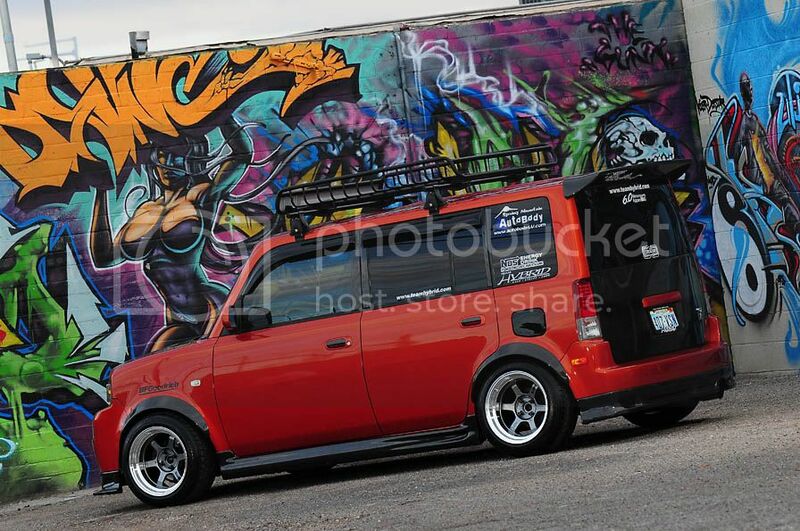 “I chose the xB as my first build because I thought, still think it is a unique car, cool looking box that had a lot of sound potential and space. I didn’t go in with the intention of building a show car but a few parts later I was hooked.” We know that story all too well. 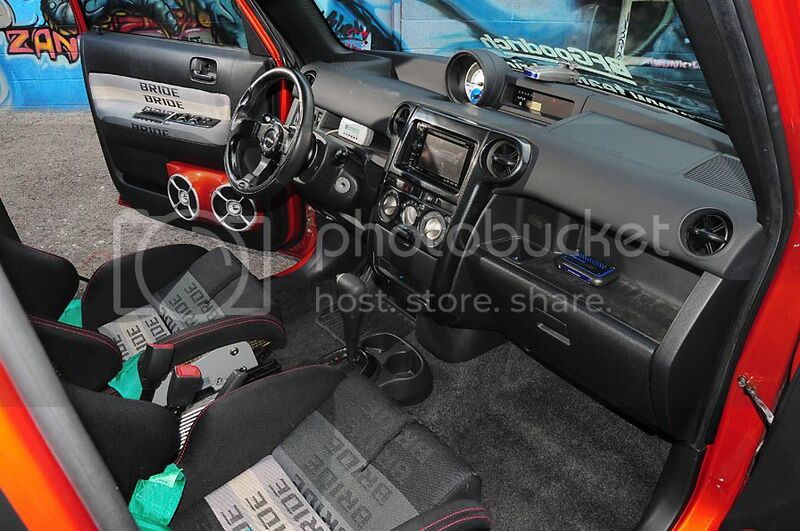 Man finds car, man loves car and man buys expensive modifications for car. Car goes off and becomes famous in PAS magazine. And what a nice story it is.